Boogers, boogies, snotters, nose goblins, snot rockets, crusties -- no matter what you call dried nasal mucus, you know what it feels like to have nostrils full of it. 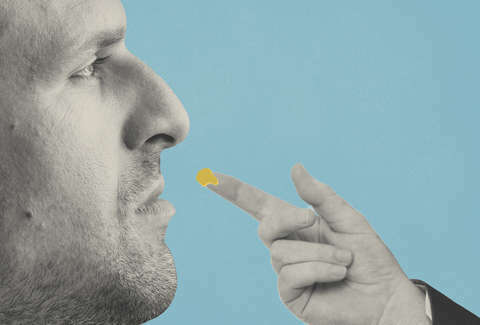 But how well do you know the ins and outs of boogers? Where do they come from, what benefits can they possibly impart, and why are they even a thing? Boogers begin their lives as nothing more than mucus. While the word "mucus" may inspire revulsion, it's a normal (as well as vital) part of your biology. You might have heard of mucous membranes, which can be found along the gastrointestinal tract (eating and pooping), the reproductive tract (sexing and reproducing), and the respiratory tract (breathing). For now, let's focus on the mucus that eventually winds its way down to the end of your nostrils. It starts in your sinuses -- you know, those hollow cavities in your skull -- and even though you're usually only aware of your sinuses when they flare up and become a symbol of hell on earth, they're actually working hard every day to maintain good health. It turns out that sinuses aren't totally hollow after all; they're lined with a pinkish membrane that manages to produce mucus all day and all night. In fact, your respiratory tract produces about a quart of slime each day. Most of it disappears without a second thought down your throat (yum! ), while some glides down through your nose. This mucus is mostly water, though it's also loaded with glycoproteins and enzymes that attack germs. Obviously you use your nose to breathe, and this is where mucus dons its germ-fighting costume. Breathing invariably means you're sucking up garbage that you definitely don't want in your body, including viruses, bacteria, and fungus -- not to mention dust, dirt, pollen, and other tiny foreign particles. Fortunately, mucus plays an important role in fighting the filth. In the nose, it acts as a filter that traps smaller particles. These particles are either eventually swallowed, meaning your digestive system makes short work of them, or they're forced out via a cough or a sneeze. OK, now that you know where mucus comes from and what it does, it should be no surprise to find out that some of this delightful mucus finds its way down to the tips of your nose. Mucus coats the lining of our beaks for the above reasons -- to help sift out stuff we don't want to breathe in -- but the mucus that settles near the ends of our nostrils tends to get dried out, being so much closer to the open air and all. Thus, boogers are born. Boogers come in all forms, and while some minor dried mucus isn't anything to write home about, some snot rockets are colorful, or impressively big, or are so dried out they become impacted in your nose. Neat! If you've ever suffered from an upper respiratory infection, you've probably noticed that your snot production increases, as does your booger production, especially while you sleep. It's harmless, as long as you can still breathe, so try not to freak out too much at your body's normal functioning. Everyone gets boogers on occasion, and while they may be an unwelcome side effect of being human and possessing a body determined to keep out contaminants, they're completely normal. But just because they're normal, it doesn't mean you need to let them flap freely, and be sure to thank your friends who let you know you've got a visible booger on board. Monica Beyer is a writer who does get her fair share of boogers. Follow her @MonicaBeyer.